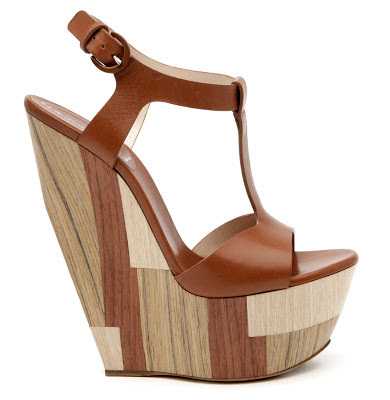 This spring Casadei highlights it's iconic Casadei “Gaga” Wedge with a "Patchwood” (patchwork wood) design detail, a geometric pattern that reproduces the varied wood grain. Exclusive to Casadei, this unique detail plays with the contrasting tones and hues of different types of wood showcasing its natural elements and nuances of colors. The towering 5" wedge sandal features an open toe, t-strap silhouette and leather upper but the true beauty is absolutely in the heel and platform. What beautiful detail! if only it weren't quite so tall, its a bit scary... but very cool!